dbone wrote: I could be wrong but I think that one in the middle is a walnut top Jeff picked out in one of the videos and said this was going to look killer. Wow, yeah he was. That's unreal. I'm a big fan of the graphite color, and those brushed gold covers are awesome! I'm undecided about that bevel on the dragonburst Osiris. Love the dragonburst, mah to the natural light bevel. 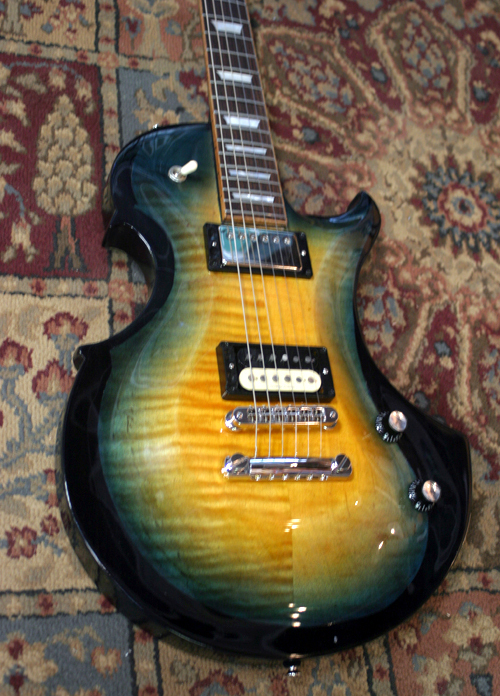 Think I'd would have stained the body to match the blue burst edges. Dragonburst and I are not able to see eye to eye.. it's one of those bursts I just can't relate to. I think I'd like it better if the two colors ran into each other a little more convincingly at the fade, like into a lighter softer blue, or maybe the same dark blue but a softer lighter green inside where the two could be blended decently. Doctor Turn wrote: Dragonburst and I are not able to see eye to eye.. it's one of those bursts I just can't relate to. I'm with you. Adding a thin blackburst on the perimeter helps quite a bit...but i think aquaburst works so much better...which to me also looks better with an additional blackburst. I wonder if anyone's done green-to-aqua or teal? I wonder if they have done any hand applied stained versions of dragon burst? The version they've been making for a few decades is a sprayed-on transparent paint. Actually, my burst preference is a toss-up between Deep Orange Burst and Aquaburst. Dragon burst would not even be an option for me. As far as these deeply beveled small bodied guitars, (like the Osiris) I really don't get the point of putting an expensive, fancy top wood and then carving 30% of it away. Whoa! That monster burst looks killer. I get a very "My Pet Monster" from it with the KRG pickups. That area behind the bridge was driving me nuts for a while until I looked up the body and noticed the shift in the color and realized what it actually was. For sure... Like a light blue over dark blue denim sort of... Or if you did dts with dark blue rather than black, and the third step was lighter blue. Exactly, to me this type of finish shows of the grain of the wood much better yet still yields a blue guitar. Many color finishes get lost in indoor everyday lighting conditions. This type would not.